I’m too tired to post anything with substance. 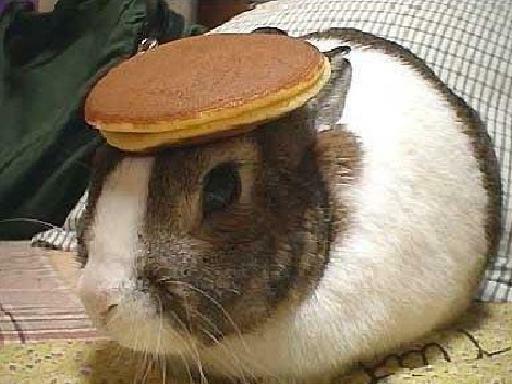 So here’s a picture of a bunny with a pancake on its head. this is a cat-bacon-tape thing, isn’t it? You need sleep, or something, obviously. Want me to send you a pic of sausage taped to Pomeranian? How about a Pomeranian taped to a Sheepdog? That would be funny. Or maybe a video…..
I’d actually like to see the Sheepdog taped to the Pomeranian…wait, I guess that’d be the same thing as taping the Pomeranian to the Sheepdog. They’d be pissed at you in any case. And I don’t know why I find the pancake on the bunny so damn funny. I also have a picture of a Panda using a zamboni machine, which is comedy gold. dammit, where’s the tape??? Com’ere, Bastian! !